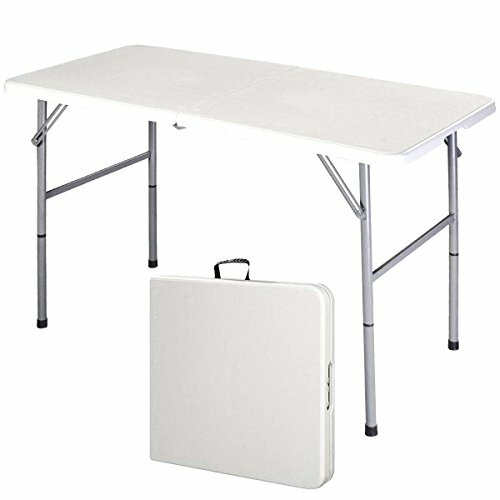 The SUPREMUS Folding Table from MyGearCentral is a 4 feet portable multipurpose fold in half table, which is ideal for family reunions, picnics, camping trips, buffets or barbecues. The folding table is made of HDPE table top and powder coated steel frame, so it resists spills and weather effects. Its sturdy and very easy to clean. Because of its foldable top and legs, it saves space and setup time as well as convenient to transport and store. Buy it and enjoy your family reunions, picnics, camping trips, buffets or barbecues! Sturdy and Durable Quality: The Supremus Folding Table is made of HDPE Table Top and Powder Coated Steel Frame. Sturdier Screw-On Legs are more stable than the thin telescopic legs. Lightweight and Portable Design: The Supremus Folding Table is easy to move and store away after use. Because of its foldable top and legs, it saves space and setup time as well as is convenient to transport and store. Smart Design: Folds in half and has a Convenient Carry Handle. 2 Height Settings @ 29" & 21". Overall Dimensions: 48"(L) x 24"(W) x 29"(H) ; Folded size: 24" X 24" X 3" ; Weight Capacity: 300 Lbs. Easy Setup & Maintenance: Legs can be locked into a fixed position for stability. Durable nylon adjustable glides protect floor surfaces. Easy to clean with mild soap and a soft-bristled brush. Lifetime of Happiness: Buy it and enjoy your family reunions, picnics, camping trips, buffets or barbecues for years to come! If you have any questions about this product by Supremus, contact us by completing and submitting the form below. If you are looking for a specif part number, please include it with your message.